If your New Year’s resolution was to eat more fruit you’re in luck—these apple-based recipes will keep you on target and have you coming back for seconds. Apples are the star of the season and for good reason: they are great for cooking and can be used in an endless number of ways, beyond just desserts. From sweet to savory, the apple is an ingredient that will not only add nutrition to a dish but also delicious flavor. Check out these apple-centric dishes and helpful cooking tips from the master and Food Network star Anne Burrell. Preheat the oven to 375 degrees F. Season the pork chops generously with salt. Coat a large sauté pan with olive oil and bring it to a high heat. Sear the pork on both sides and on the fat edge, working in batches if the chops don't all fit in the pan at the same time. Be sure not to crowd the pan. Remove the pork from the pan and place on a cookie sheet. Finish the pork in the oven for about 10 to 12 minutes. Remove from the oven and let rest for 10 minutes before serving. Ditch the excess fat from the sauté pan. Give a drizzle of fresh olive oil and add the onions and crushed red pepper and season with salt. Cook until the onions become soft and aromatic. Add the apples, cinnamon and rosemary and toss to coat with the oil. Add the cider and cook until the cider has reduced by two-thirds and the onion-apple mixture is very soft and saucy. Serve over the pork chops. Anne’s Tip: Get high quality pork – commercially raised pork tends to be too lean. Taking the time to source a quality product will result in a more succulent pork chop. Preheat the oven to 375 degrees F. Toss the squash rings with olive oil and salt and bake on a sheet tray in the preheated oven for 15 to 20 minutes or until the squash is soft and starting to caramelize. Repeat this process with the mushrooms. *Hint – these can be done at the same time! Reserve until ready to use. Toss together the radicchio, arugula, apple and pumpkin seeds in a medium bowl. Dress with vinegar, olive oil and salt. The salad should be dressed and well seasoned but not soggy. To serve: Return the squash and mushrooms to the oven for two to three minutes, just to warm them up. Place a squash ring on a serving plate. Place a handful of the salad inside the ring. Cut the mushrooms into four slices and arrange them, fanned, on the side of the salad. Drizzle with pumpkin seed oil. Anne’s Tip: Don’t freak out if you can’t find acorn squash. Grocery stories and markets will have a variety, such as butternut or pumpkin. This goes for the mushrooms too – if you want to change it up, skip the Portobellos and toss in porcinis instead! Coat a large sauté pan, over medium heat, with olive oil and add the onions and celery. Season with salt and cook until the veggies start to become soft and are very aromatic. Add the garlic and cook for another one to two minutes. Add the sausage and cook until the sausage browns. Stir in the apples and apple cider and cook until the apples start to soften, about three to four minutes. Sprinkle in the sage leaves and the walnuts and turn off the heat. Preheat the oven to 350 degrees F. Add the diced bread and toss together. Pour in the chicken stock and knead with your hands until the bread is very moist, actually wet. Taste to check for seasoning and season with salt, if needed, (it does). Transfer to a large deep ovenproof dish (roughly 9 by 11 inches) and bake until it is hot all the way through and crusty on top. Remove from the oven and serve. Anne’s Tip: This recipe should be considered a year-round treat. Two other ideas: Use it to stuff pork loin, or make small cakes out of the stuffing by frying a small amount and topping with a poached egg. Brunch in minutes! To make the crust: In a food processor combine the butter, flour, sugar, salt and lemon zest. Pulse until it looks like finely grated Parmigiano. Add the egg yolk and 1 to 2 tablespoons of the water. Pulse, pulse, pulse until the mixture comes together. If it seems a bit dry add a little more water and pulse, pulse, pulse. The mixture should come together into a ball. Dump the whole thing out onto a clean lightly floured work surface. Knead the mixture 1 or 2 times only to make it a smooth ball. Using a rolling pin or your fingers roll or press the dough out to an even circle about 11 to 12 inches in diameter. Transfer to a cookie sheet lined with plastic wrap and refrigerate for at least 1 hour, or preferably overnight, covered with plastic wrap. Preheat the oven to 425 degrees F.
To make the filling: While dough is chilling, place the sugar, apple cider, lemon juice, and vanilla bean seeds in a 10-inch nonstick ovenproof pan. Stir to combine. Over high heat bring the mixture to a boil brushing down the sides of the pan occasionally with a pastry brush dipped in water, if necessary. After 6 to 7 minutes the mixture will eventually begin to turn light brown. Swish the pan around gently to promote even cooking. Cook the mixture for another minute or so until the mixture becomes a much deeper amber color. Remove from the heat and stir in the butter, 2 pats at a time. The mixture will bubble up. That is OK, just be VERY CAREFUL not to get any of this on you. When all of the butter has been incorporated, begin to arrange the apples rounded side down in circles. Try to do this neatly and in a pretty way. Remember, the bottom will be the top! Return the pan to the burner and cook over medium heat for 20 minutes. Remove from the heat. Retrieve the chilled pastry from the refrigerator and place it on top of the apples. Tuck the pastry in around the edges of the pan. Bake in the preheated oven for about 20 to 25 minutes or until the dough is golden brown and crispy. Let the tarte cool for 10 to 15 minutes. Place a serving platter upside down on top of the pastry and CAREFULLY flip the platter and the pan over. Let the tarte fall gently out of the pan. Slice tarte into individual pieces and garnish with a dollop of sweetened mascarpone. Anne’s Tip: I’m a fan of anything with apple and caramel, one of the world’s classic combinations. For this tarte, it’s essential that you take the time to make it look pretty during the assembly process. The top starts at the bottom, so make sure to take your time for a beautiful end result. 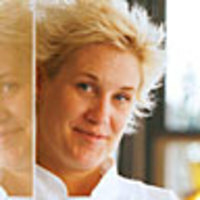 Anne Burrell has worked at top restaurants in New York, studied culinary landscapes and traditions of Italy, and worked as Mario Batali’s sous chef on Food Network's Iron Chef America. She is host of the Food Network series Secrets of a Restaurant Chef.